Nimo came to the UK as a refugee from Somalia in 2009. In 2010 she had her first child who developed health problems which meant Nimo wasn’t able to attend mainstream classes. Her Health Visitor referred her to SAVTE for 1:1 lessons. After 7 months she was able to progress on to classes. She completed and passed all ESOL Entry Levels 1, 2 & 3. She is currently studying Maths and Level 1 Functional Skills English. I was level zero when I first came, It was like being blind and deaf, I knew people were asking me questions but I couldn’t answer. “ I was level zero when I first came, It was like being blind and deaf, I knew people were asking me questions but I couldn’t answer. I had to have an interpreter all the time, I needed someone to help all the time – it wasn’t good. When my child was 5 days old he became ill and my Health visitor referred me to SAVTE. SAVTE gave me a teacher who came to teach me for 7 months. I then had enough English to be able to go to an Entry 1 class that had a crèche, I passed my exams and moved to Entry 2. Learning English has made so much difference to me, now I don’t need anyone to help me …I’m free! I stopped going to classes for 2 years as I had more children, but I taught myself for 2 years by watching YouTube and the ‘Learn English’ from the BBC, because if I stopped I would have to start again from the beginning. After this time SAVTE invited me to their Entry 3 class. I passed all my exams and now I’m studying Level 1 Functional Skills. Learning English has made so much difference to me, now I don’t need anyone to help me …I’m free! I have passed my driving test I want to go to University & I want to be a nurse, that would be my dream come true! 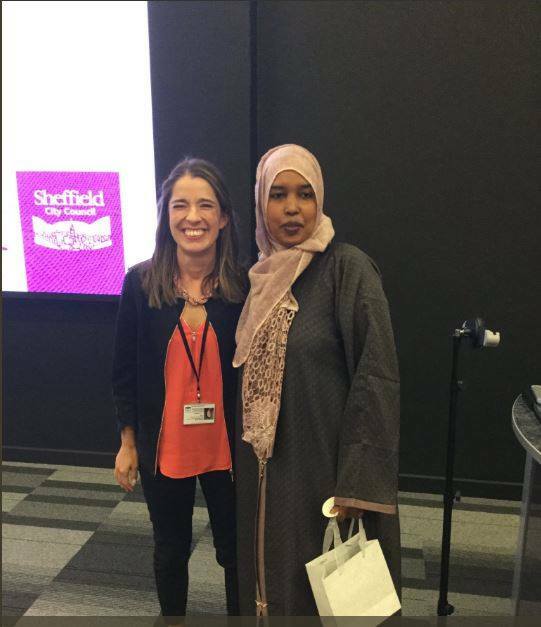 Nimo was rewarded for her efforts and commitment to learning recently at Sheffield City Council’s Learners Week Award Ceremony and received a certificate and an iPad for her hard work. We wish her every success for the future.